I have been a composer and a performer since my teen-age years. More recently, I have been doing a lot of musical improvisation, though the music I come up with sounds new-age, or classical, rather than jazz. Still more recently, I have been arranging pieces for the new musical instrument I invented. This sampling of my music includes a few of all of the types of music I have composed, improvised, arranged, and performed. For each of the audio files, you should be able to click on the link, and it will play it. If you have slow Internet speeds, you may have to right-click on the link, and select “Save Link As...” (or something like that), to download it to your computer, and then you can double-click on the audio file you just downloaded. All of my musical life, I have been composing music, from the earliest days as a teenager, to present. I have included a sample of those compositions here. Currently, my primary instrument is a Yamaha S90-es synthesizer, and also the KeyMusician Keyboard (the new instrument described below). A common methodology in my composing, is to work out my ideas for an impromptu performance (usually using piano with a hint of strings in the background). When I'm confident I can improvise something good for the desired amount of time, I hit “record” on the sequence-editor, and start playing. Usually within 4 'takes' I have something I like, and use the best one of them as a basis of the new piece. As an example of that, I offer my composition “Impromptu 2 – Sunlight on the Water”, first as the piano impromptu piece it started out as, and then as the polished composition, with a small ensemble of instrument parts improvised with it. Decades ago, I purchased a Roland D20 synthesizer, and did a lot of compositions on that. When I got my newer Yamaha synthesizer, I converted those pieces to be played on the new synthesizer. But where the new synthesizer was more capable than the old D20, I also added additional instrument parts. In the two pieces offered here (originally from that period), there was only the string part on the Roland D20. All the other instruments you hear have been improvised against the original string part. Over the past several years, my ability to compose music on-the-spot has increased markedly, as I have been working in that direction. Strangely, I am beginning to wonder if it is better to keep improving my improvisational abilities, and just perform impromptu pieces all the time. The first composition on this web-page (above - the piano-only version) is an example of that. But also, the other instrument parts of the final version of that piece are also improvisation, though the process is more careful, and painstaking. For my musical improvisations, I am using a different synthesizer, since the Yamaha is big, heavy, and not easy to transport. 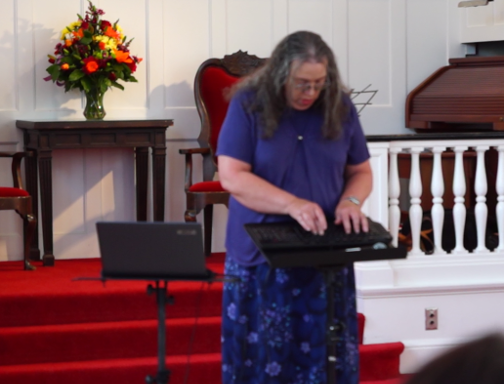 For the venues where I have performed musical improvisation, I use an 88-key MIDI keyboard, connected to a laptop, on-which runs the sound-generator (synthesizer). An amplifier is connected to the laptop for the audio output. Also mounted on the main keyboard, is a mini-keyboard (of only two octaves). On this mini keyboard, with my fingers, I improvise a solo instrument part (usually an oboe), while my thumb of the same hand hits accented notes on the main keyboard an inch below. I find that the solo instrument adds a lot to the variety of the improvisation, and affects in major ways, the direction the piece goes. And also, I really like the sound of the solo instrument as part of the piece. This setup is very portable, and has a very good sound. One other thing I do for enhancing the sound, is my use of what I call “composite voices”. This is done by sending the same MIDI performance-data to a main instrument (such as piano or guitar), and also to a secondary instrument (at less than half the volume), such as a metallic pad, or a string ensemble. So in the pieces you are about to hear, the piano sound isn't just a piano, but has a 'touch of' strings with it – similar to my favorite piano sounds on the Yamaha S90-es. I do the same thing with the steel-string guitar sound. The next piece is an improvisation I did with the rock band Marjum Pass, with their “Pink Buffalo” song (Copyright © 2015, Marjum Pass, used by permission). 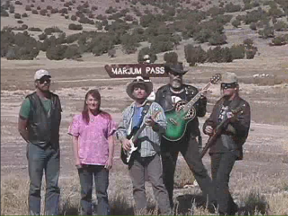 The band is named for a pass in the west desert of Utah. I improvised a string-orchestra part with it using the KeyMusician Keyboard. You can listen to the song by clicking on the picture below. A new musical technique yields a beautiful, unique sound. 1. Chords, played with the left hand, are higher-up, in the middle-range, where they sound better. 2. The bass-line is played with the thumb of the right hand. 3. The melody is played with the other fingers of the right hand, way up high. 4. Layered voices (such as piano/strings), or orchestral sounds allow the use of those ethereal high notes. 5. The sustain-pedal control (which would blur-together melody notes) is not needed, since all the notes are within easy, simultaneous reach. 6. Notice how simple and easy it is to play, even after changing to a key-signature having 4 sharps. 7. Using a gamers' keyboard with anti-ghosting, you can play an independent note simultaneously with each finger - notice the 10-note chord at the end. You can watch videos of me performing on the new musical instrument (the KeyMusician Keyboard) below. Click on the pictures below to watch the videos on Vimeo. I have performed with the new instrument on numerous occasions. It's easy to transport. The selections above give you a quick sampling of Aere's music. If you like it, and would like to hear all of her music, you can click the link below, which explores all of her music to date – album by album.